The next stage of the Queen Elizabeth II Centre’s £12 million renovation and rebranding project will get underway on 24 July, when the central London venue closes for six weeks of interior and exterior improvements. The centre’s focus on customer experience will see new static and digital signage systems installed to aid wayfinding and showcase event branding. New ceilings will team with new dimmable halo lighting, strip lighting, LED colour changing uplighters and ceiling mounted moving lights. Flagship room The Churchill Auditorium will introduce star cloth to add glamour and glitz to concerts, awards ceremonies, parties and other special events. This new centre-wide lighting infrastructure will support the award-winning venue’s move to attract a broader range of event types. Greater breakout room capabilities will be created through reconfiguration of spaces on level 2 of the centre, while more than 4,000 new, luxury Boss Design conference chairs and tables will refresh classroom configurations, top tables and boardroom setups. The renovated front canopy, which occupies Broad Sanctuary, opposite Westminster Abbey, will feature colour customisable pin spot lighting. 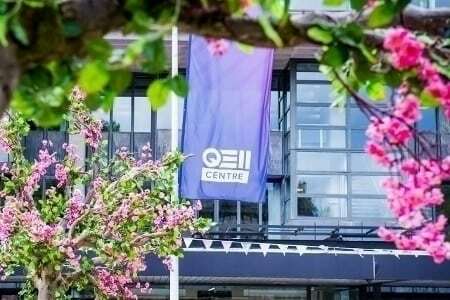 The QEII Centre began a £12 million capital investment programme and rebranding 18 months ago, to pull the centre out of the ‘80s and re-establish its ‘wow’ factor, improving visitors’ experiences. Cutting-edge technology, luxury fixtures, discreet security and a QEII concierge have combined to warm the welcome, while the remodelled foyer is now bright and spacious with airport-style check-in desks to aid concurrent registration for events. The centre is an increasingly successful profit making agency, paying an annual dividend to the Exchequer of £1.5 million in 2014/15, achieving target. This is forecast to increase to £1.7 million in 2015/16, and is projected to rise further over the centre’s corporate plan period. Summer refurbishment works at QEII Centre are due for completion in early September.